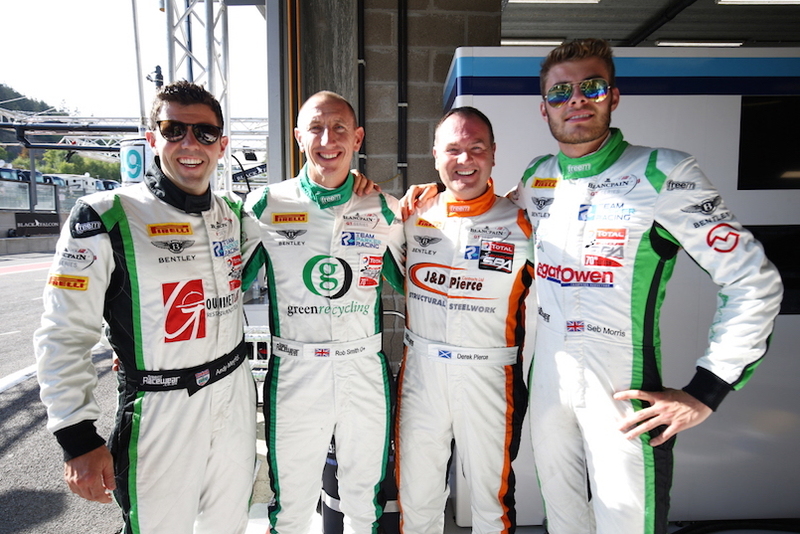 Seb Morris’ dream of battling for a Pro-Am podium on his debut in the Total 24 Hours of Spa this weekend, 28th/29th July, was rightly replaced by heartfelt concern for team-mate Andy Meyrick after a major accident involving the Bentley Continental driver midway through the race. At 3.00am local time on Sunday morning, Meyrick and the No.666 Lamborghini of Jurgen Krebs were involved in a monumental accident – the severity of which led to a race stoppage for the fourth round of the Blancpain Endurance Cup and required both drivers to be extricated from their cars. Initially taken to the Spa-Francorchamps circuit medical centre before being transferred to nearby hospital, Meyrick and Krebs sustained a number of fractures and both remain under observation due to the high-speed nature of the extremely serious accident. 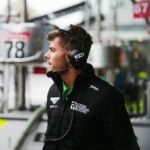 “The only thing that matters about the weekend is Andy being as OK as he can after such a massive accident – all our thoughts are with him”, said relieved BRDC Superstar and MSA Team UK driver Morris, “It was the worst crash I’ve seen, the damage to the car was huge. Most importantly, Andy’s injuries are fortunately not critical and he should make a full recovery in four to six weeks. 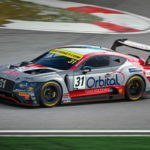 While all thoughts obviously remain with Meyrick for a swift, safe and speedy recovery, and Krebs too of course, the story of the race for Team Parker had earlier twists and turns when problems with straight-line speed for the No.31 Bentley Continental GT3 hampered their challenge. Morris’ week in Belgium began with the annual parade of Total 24 Hours of Spa race cars into Spa city centre on Wednesday, 25th July, before the free practice on Thursday, 26th July, which led into pre-qualifying and official qualifying later in the day. With each of the team’s drivers having their own 15-minute session, Rob Smith took the first run and posted the second fastest time in Pro-Am with a lap of 2m22.470 seconds. Derek Pierce was fifth in Pro-Am in session two, a lap of 2m21.955 seconds his best, while Meyrick took session three and produced a time of 2m20.649 seconds to go fourth in Pro-Am. Morris took the final run, featuring some of the world’s truly premier GT3 ‘factory’ drivers, and delivered a superb lap of 2m19.923 seconds to end Q4 with the second fastest time in Pro-Am, notably a mere four hundredths of a second shy of quickest in class. With the times from all four sessions combined, the No.31 Bentley started the race from third in Pro-Am and it was Morris who was tasked with the opening stint. Running fourth in Pro-Am at the end of the first lap, he remained there during the early going and was very happy with his performance, Morris actually setting the Pro-Am pace with a best lap of 2m21.016 seconds. Just after the half-hour mark though, having slipped to fifth, he pitted the Bentley due to a noticeable drop in power on the straights. 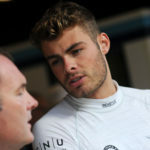 Rejoining the race at the tail of the 60-plus car field, having lost significant time with the pit-stop, Morris continued behind the wheel until the 90-minute mark when he pitted to make the first driver change to hand over to Meyrick. Inside another 25 minutes, though, Meyrick pitted with the car still struggling and a much bigger investigation took place where the Team Parker crew identified a failed fuel injector as the cause of the issue. As soon as it was resolved, even though hopes of a strong Pro-Am finish were gone due to the loss of time and laps to the front-runners, the Team Parker drivers strived to at least try and complete the 24-hour race. During Morris’ night-time stint he delivered sensational pace which was a match for the fastest ‘Pro’ drivers on track. Emerging onto the circuit in a group of front-running Pro cars, the Welshman was instantly up-to-speed and he passed no fewer than six of the rivals and set the third fastest lap overall at that point of the race – a notable and impressive performance. 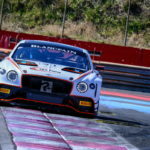 Spain’s Circuit de Catalunya in Barcelona will host the fifth and final round of the 2018 Blancpain Endurance Cup season a full two months from now, on Sunday, 30th September.